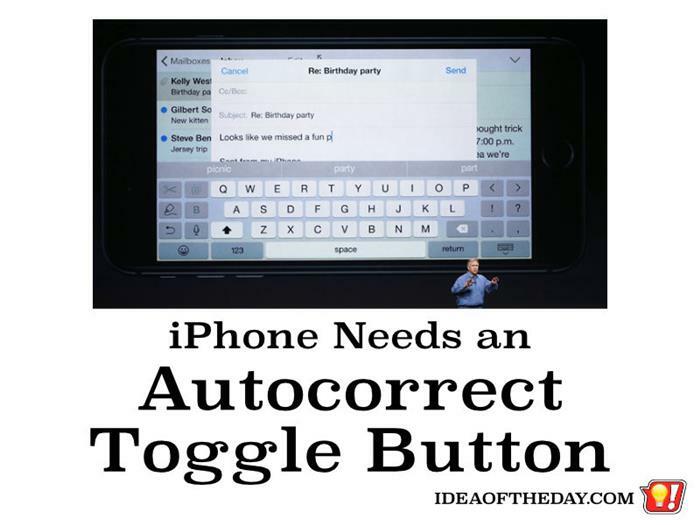 Autocorrect Toggle Button.... OFF by Default. I don't know about you. But I spend more time fixing autocorrect wrong guesses than I would fixing my own typos. When Apple created iPhone, they knew people would take some time getting used to texting on a device without a keyboard, so they created autocorrect... typing on training wheels. Now that people have gotten used to typing on a touchscreen, I think it's time Apple started phasing out autocorrect. There is already an option "Settings" that lets you turn auto-correction off, but it's somewhat hidden and most people don't change it. I challenge anyone reading this right now to turn it off for one week. If you do, I bet you won't change it back.